Novel Writing: Should your protagonist be autobiographical? I’ve written extensively about the fact that my protagonist from my first book is me. He’s more funny and probably smarter, but he’s still me. I’ve also read blog posts and articles in the past that say the practice of creating a fictional character who takes after the author is not all that uncommon, especially when it comes to first books. Two authors who come to mind when I think of this practice are Sue Grafton and JK Rowling. Sue Grafton and her fictional California-based PI are one in the same. I believe, though I’m not checking right this second, that JK Rowling and Harry Potter share a birthday. My reasoning for doing this had only to do with the fact that I felt it would make the story better. I wanted to put myself in Andrew’s shoes every step of the way during that first case. I wanted him to face some internal dilemma that couldn’t be seen from the surface. I wanted him to be real. And I wanted the reader to be able to relate to him. I have no idea how well I was able to do this in my first book, but it was constantly on my mind as those 21 chapters were written. So now you know that Andrew Banks is really just John Guillen in disguise, but what about you? 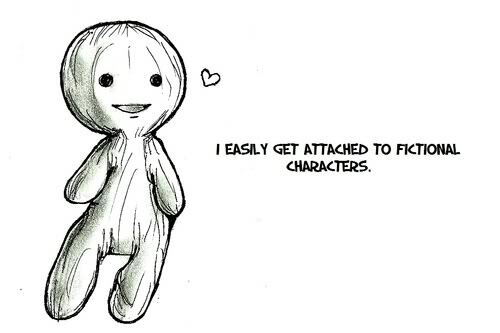 Have you written a protagonist who perhaps shares some characteristics with you? Or who maybe shares something like a birthday with you? Tell me! I first saw this story tweeted a few days ago. I tried to guess who would top the list before clicking through. My guess was JK Rowling. It took about half a second for me to come up with her. 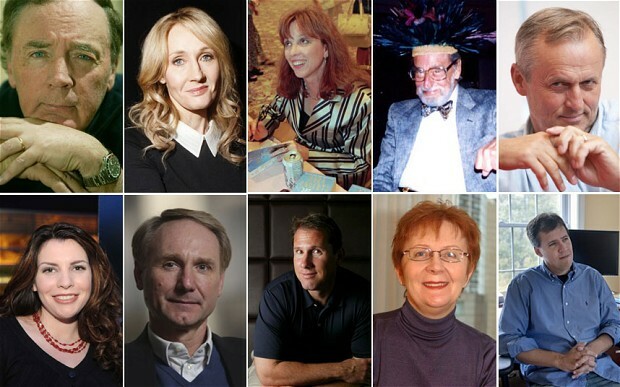 Even though so many authors have written more books during that time period than she has, I thought Mr. Potter and friends would be enough to catapult her to the top. I won’t tell you if I was right or not. You’ll just have to continue reading! Now you may not know him by name, I do, but he’s the author of the Diary of a Wimpy Kid Series. I’ve never read any of these, though the first in the series is on the Amazon list so I’ll be reading that one at some point. It’s very understandable that one of the bestselling children’s authors today would make the list. Another author that is understandably on the list. Her Stephanie Plum novels are as popular as any. Another author I haven’t read. All of this guy’s books are seemingly made into movies. So obviously he’s selling A LOT of books, right? Haven’t read him. Honest question, what does he even write about? I know everything with his name on it becomes an instant bestseller, but I have no idea what his books are about. The Da Vinci Code and Inferno are the two that I know the names of. I just did a quick Amazon search and his books look like nothing I would be interested in. Author number four I haven’t read. Hey look, we have the same name. And last initial! I haven’t read any of his books, BUT I have A Time to Kill on my shelf waiting for my reading pleasure. It’s long. Like really long. I’ll read it eventually. No commentary needed. First author I’ve actually read on the list. I know she writes A LOT of books but I haven’t read any. I’m sure they’re quite good. UH OH. Who the heck could pull the upset?! Think! Think! Think! Read the first book of Potter. Thoroughly enjoyed it. I was slightly surprised by her not holding down the top spot. All of these authors are great, all of them, but she’s one of those authors who will be remembered a hundred or two hundred years from now. Harry Potter will never be forgotten. I guess we can only continue on to the final name on the list. Ahhhh of course. I was surprised by Patterson taking the top spot, but I wasn’t shocked by this. If you aren’t a fan of Patterson’s, you should know that he has several series ongoing. He utilizes the writing of ghostwriters whom he credits as co-authors and every one of the series is a bestseller. Every one. He has six of them. And standalone novels. He has nine books scheduled to be released in 2014. So there you have the list of the world’s bestselling authors since 2001. Were you surprised by any of the names on the list? Or any of the names who didn’t make the cut? Let me know! 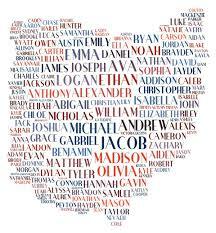 Novel Writing: How do you name your characters? If you all haven’t noticed I love my posts to ask you questions about books or writing or publishing or something in between. It gives me a chance to interact with every one of you who chooses to offer your insight. And I do mean insight, because yes I’ve written a book that I love and am working on my second, but I’m always looking for advice on how I can become a better writer and I’ve already gotten so much from you guys just in the last month or so from your comments and feedback. So let’s talk about naming characters, shall we? There are SO many aspects to a good book, right? The first line. The title. The people who made it happen behind the scenes. The storyline. The dialogue. AND the names of all the characters. I would never go so far as to say any part of writing a book is easy, but writing the actual book is probably the easiest of everything. Somewhere in there we have the difficult task of naming characters. It’s not the most difficult thing you’ll do, but you best believe that it won’t be the easiest. Now this list isn’t exhaustive and I won’t tell you which names I came up with and which ones I didn’t. That makes it more fun. But four of the names are the exact names of people I know. And one is just the first name. I dare you to figure out which ones are not real. So you know my philosophy, stealing, now I want to know yours. How do you name your characters in your book? And tell me some names you’ve come up with and we can compare! I must first apologize to you guys. I had said that the next book I’d be reading from the Amazon list would be A Wrinkle in Time. My bad. It WILL be the next one now because it’s the only book I currently have from the list. But that doesn’t matter yet. 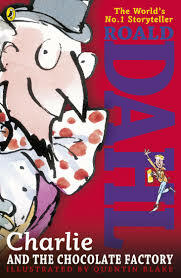 The purpose of this post is to talk about the book I did read, Charlie and the Chocolate Factory by Roald Dahl. Let’s jump right in. The book begins by introducing the reader to the family of Charlie Bucket. You immediately realize that his family is experiencing some hard times. He lives in a house that is much too small for his family of seven, four of which are grandparents. They barely have enough to eat. And Charlie gets excited once a year on his birthday when he receives a whole chocolate bar for himself. Then life becomes even more difficult for the Bucket family. His father loses his job and can’t find full-time work elsewhere. The family begins to starve, literally. Until world famous chocolate genius Willy Wonka announces that he’ll allow five children inside his factory for one day. All you need is one of five golden tickets. The first four are quickly found. Then Charlie finds a dollar bill on the ground during his walk home one day. He buys two chocolate bars and the second has the final golden ticket. The following day Willy Wonka takes the five children on a tour of his factory and one by one each of the children act out and are taken from the group until only Charlie and his grandpa remain. This is when Willy Wonka reveals the real reason for his tour. He’s giving his factory to Charlie. All of it. I definitely enjoyed the book. Would I call it one of the best books I’ve ever read? No. I realize that Roald Dahl is one of those iconic authors of the twentieth century who everyone seems to have read at some point. This book just didn’t make me want to go buy his other well-known works. I have some issues with the book. There were WAY too many exclamation marks. I’m talking in the hundreds. Yes, Willy Wonka is enthusiastic and energetic, but I couldn’t read any more dialogue ending in an exclamation mark if my life depended on it. I honestly believe the dialogue took away from the book. I liked Charlie as a character and liked the chapter titles, and the book itself wasn’t bad, but I’m actually surprised to find this book on the Amazon list. I’m thinking this was one of those body of work kind of picks. You’ll recall that I have my own list of the best books I’ve ever read and The Diary of a Young Girl by Anne Frank ranks #1 and Harry Potter and the Sorcerer’s Stone ranks #21. This book didn’t make the list at all. It’s currently 113 titles. I’ve seen the first movie and enjoyed it but not the more recent one. I’d love to hear your thoughts on this book. I’ve now read seven books from the list. 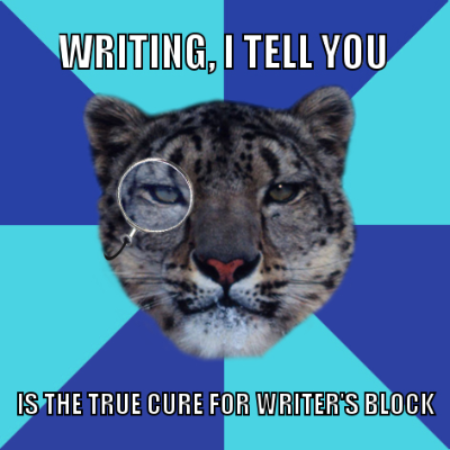 This is my third post about writer’s block in as many weeks. BUT this time around it’s a tale of victory rather than defeat. That’s right! I told you guys in the last writer’s block post that my manuscript hadn’t been touched in weeks. Actually, I came to find out that it was more than a month. Which made me sad. Last Saturday night I actually got some writing done! The funny part is that the chapter ended up going in a direction that I hadn’t even thought of until I sat down to write. Maybe that’s all I needed to do? Anyway, I wish I had something interesting to tell you all about why that day was different from so many before it. I don’t. Honestly, this is what happened. Saturdays are definitely my laziest day of the week. I typically get off work and go home and sleep for several hours because I’m so tired. I did that last week, but this time around I spent hours thinking about my beloved manuscript that was getting dusty from lack of use. I thought about it all day long. I watched the hours tick by and thought it would be another day of nothing. Then I simply opened my manuscript about 10:30 that night and sat there staring at it. Then I wrote. You see, this experience was far more than not having any creative ideas for my story; I was fighting a fight within myself. All along I knew I needed to write, but I dreaded starting. I knew it would be difficult. I knew it might not be what I originally planned. I knew a lot of things except for what I wanted to write, until I did so. So don’t sit there and think about why you DON’T want to write, think about why you do. Then do it. Question: Which book description is more enticing? I love that more of you guys are Liking, commenting, reading, and following my blog. Obviously, right? Well, now I’m going to ask for your input on a relatively important issue I’m facing. My book’s description on Amazon! This will likely be the third time I change it, and I’m counting on you all to help me out a bit. Sound okay? Okay. Also, you should know that I’m not really worried about the book description selling more books. My book came out almost six months ago and I rarely tell people about it in person anymore because I’ve already told just about everyone I know. A teenage girl walks into the office of Houston area private detective Andrew Banks a day before the office is set to open. But Mercedes is sent home before she’s able to disclose anything about why she’s there in the first place. As instructed, she returns the following day after taking the night to think about why she needs a private detective, but still, she’s unable to give Banks any concrete information about her problem. All she knows is that her parents appear to be more combative than she’s ever seen them, and not much else. Banks agrees to take her on as his first client thinking it’ll be a walk in the park, until he meets her parents. Alejandra is a stay-at-home mom who often buys herself things for all the work she does at home. Carlos is a banking manager who can no longer afford his wife’s constant buying. Just when Carlos is on the verge of financial collapse, an old high school friend makes his way into his life. Carlos is offered a job that pays $10,000 a month and all he has to do is drive a car. That is, from Houston across the Mexican border and back again every two weeks with drugs being his only company during these long trips. Now Carlos Vega wants out. Banks is ill-equipped to handle the case on his own, but he’s given no choice. Police intervention isn’t an option and an entire family entrusts him to get them out alive. He vows to do his best, but even that may not be enough. Houston area private eye Andrew Banks is hired by sixteen-year-old Mercedes Vega to determine what’s dividing her parents. As soon as he meets the rest of the Vega family he realizes that the situation is only one step from becoming dire. He puts the safety of the family over everything else until the case hits much too close to home and it becomes a race against a wealthy restaurant owner that ultimately turns deadly. Okay, those are your choices! Don’t go on Amazon and cheat, please! In short, what’s your favorite series of books? Now I know this is not an easy question for any bibliophile out there to just answer without any thought. It isn’t for me, but hopefully by the time I reach the end of this post I’ll have an answer for you guys. Let me first begin by listing some of the series that I read. Spenser. Harry Bosch. Hunger Games. Karen Vail. Alex McKnight. Alex Cross. Will Trent. Grant County. Gears of War. Halo. Charlie Hood. Jesse Stone. Jack Reacher. Kinsey Millhone. Merci Rayborn. As you can see, I read a lot of different series. I have several more on my shelf that I have yet to start. Now, let me see if I can narrow it down a bit. Merci Rayborn and Kinsey Millhone aren’t my favorite. I’ve only read two Jack Reacher novels, though both good, not my absolute favorite series. Charlie Hood is written by one of my favorite authors but isn’t the best series I’ve ever read. Jesse Stone and Spenser are both written by the same author and I’ve read more Spenser books. Will Trent and Grant County merge into one series later. Karen Vail…good but not great. Same goes for Alex McKnight. That leaves these for me to decide on my favorite: Spenser, Harry Bosch, Hunger Games, Alex Cross, Gears of War, and Halo. I’m sure some of you are fans of the video games, but if you haven’t read the books then you absolutely should. It makes the storyline of the games look like nothing. My reasoning for putting this series at number six is because the books are written by several authors, which sometimes makes the Master Chief change from one book to the next. They’re all good books, and a couple of them are truly great. Three of them are ranked in the top fifteen of my list of best books read. Might as well get the other science fiction series out of the way, right? I have every book of the series and I’ve read all but one. One of these is actually the longest book I’ve ever read at just a couple of pages under 600. Again, I’m sure some of you are fans of the video games, but there is SO much more to the story than the games can possibly offer you. SO MUCH. Karen Traviss has done a phenomenal job writing these books and you definitely see all of the characters in the books exactly as they are in the games. I have one of the books ranked as the eighteenth best book I’ve read, which is very high, but the others fall a little short. Just an overall solid series. 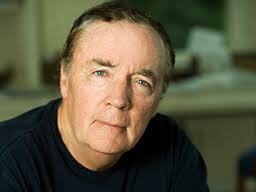 James Patterson has his critics for the way he writes and publishes, BUT the guy can entertain his readers like no other author I’ve ever read. Sure, his stories are sometimes farfetched and unbelievable, but you only think that AFTER reading the book. His way of writing two-three page chapters keeps you wanting more. He literally has you on the edge of your seat while you read. I believe the Alex Cross series is the only one of his that he writes alone. Four of these books rank in the top nineteen books I’ve ever read. Alex Cross has been adapted to film three times and none of them have matched the quality of the books. This is a series for every reader of crime fiction. This is where I start having to nitpick just to continue the list and not declare a tie. I started the series late (it began all the way back in the 70s). I started the series after having read every available book of the Jesse Stone series a couple of years ago. Suffice it to say that I couldn’t buy the books fast enough. Spenser is a former boxer turned Boston PI. He’s smart, witty, and loves to cook. He has a set of values that you rarely read in detective fiction. He’s always looking to help someone. Always. There isn’t much more for me to tell you. Start the series. Man this is tough. I’m sitting here going through the books of the two remaining series and I can’t come up with anything negative for either one! The Harry Bosch series by Michael Connelly was started in the early 90s. We’ve seen him age and adapt in real-time. It’s a wonderful thing to read. He’s a detective working with the LAPD and he takes every homicide victim to heart. Every one. You’d think that they were all family, and it just so happens that one of them was. Bosch is the guy cop shows try to show on screen. He’s the guy who never treats any one case differently than another. He’d solve every case if he could. He provides justice to those who need it most. If for some reason you haven’t started this series and you read crime fiction, then start it. AND THE WINNER IS………..Hunger Games! I’m not trying to follow in everyone’s footsteps. I’m not. Yes I know the first two movies have begun a mega-blockbuster series. Yes I know millions of readers have declared their love for the series. Yes I know that there are similar YA series out there that many would argue are better. The thing is that I don’t care. I started this series at the beginning of 2012. I had no expectations because I honestly had no idea what the heck it was. I didn’t have a blog and I was unaware of the hype surrounding the series as the first movie’s release date neared. That first chapter, the one in which Katniss does the unthinkable and volunteers from District 12 to participate in the annual Hunger Games so her sister doesn’t have to, brought tears to my eyes and goosebumps down my arms. What author can accomplish that so early in a book?! The rest of the book flew by as I couldn’t stop reading. The second in the series, Catching Fire, managed to outdo its predecessor. I will admit, though, that the third book wasn’t quite on par with the first two. It was a great book and one couldn’t possibly predict how the series played out, but the other two were unforgettable. So there you have my list, now tell me which series of books has left its mark on you permanently?